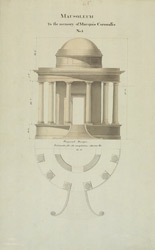 Watercolour with pen and ink of a design for the mausoleum in memory of Marquis Cornwallis at Ghazipur by W.G. Stephen c.1819. Inscribed on the front in ink is: 'Mausoleum. To the memory of Marquis Cornwallis. No. 1. Original Design. Estimate for its completion 120,000Rs'. Ghazipur, located east of Varanasi on the banks of the Ganges river, is the site where Marquis Cornwallis (1738-1805) died on 5 October 1805. Cornwallis was the Governor-General and Commander in Chief in India from 1786 to 1793. He is credited with laying the administrative foundation of British rule in India and was given the title of Marquis in 1792 for his pivotal role in the Third Mysore War. In the early 19th century, Cornwallis was honoured through portraits, statues and monuments across India.